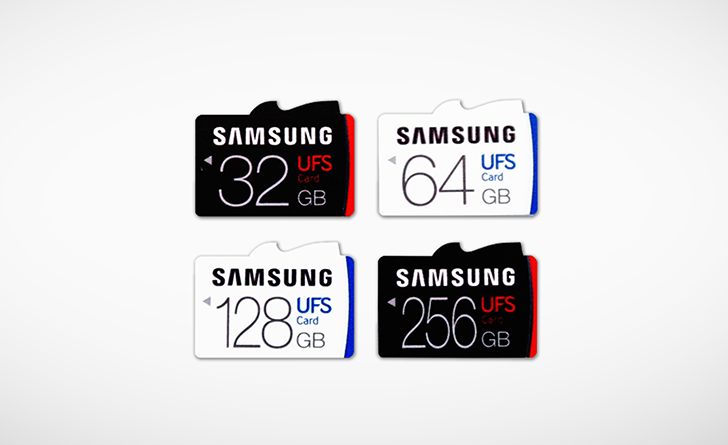 Samsung has been championing Universal Flash Storage (UFS) storage for a couple of years now. Back in February of 2015, it started mass producing embeddable UFS chips at up to 128GB capacity to replace the typical eMMC cards that smartphones had been using previously and provide super fast read, write, and random read and write speeds. The goal, at the time, was to convince users to dump external MicroSD cards and see the benefit of fast embedded storage, which was even later raised to 256GB. That strategy, which was carried out in the Galaxy S6 (and corresponding line-up), didn't pan out all that well with the company's avid power users who loved the flexibility of removable storage, and Samsung resolved to adding back the MicroSD slot the next year in the Galaxy S7. This short history lesson is to tell you that Samsung doesn't joke about UFS — its embeddable chips are even used nowadays in several other brands' flagships — but that its tumultuous past with UFS and MicroSDs created a reason to build this new product: a card that looks like a MicroSD but that uses the UFS 1.0 Card Extension standard under the surface. I think they should have just called it the best of both worlds. Samsung is adamant about not calling these new cards "MicroSD", but you just know they have to look and slot like them in order to be compatible with the largest possible number of devices. Edit: the card definitely looks like a MicroSD card and seems like it could be backward compatible with MicroSD slots, but that doesn't mean that it actually is. The news release doesn't specify what kind of slot you need to read these new UFS cards, so it might work with regular MicroSD slots and it might require a newly designed slot. We'll have to wait on further official information from Samsung. There are two benefits to using UFS compared to traditional storage solutions: it can read and write at the same time and it can manage and reorder tasks more efficiently thanks to a command queue feature (read more about it here). This results in super fast speeds in all respects when compared to regular MicroSD cards. Random write: UFS up to 35,000 IOPS vs MicroSD up to 500 IOPS. Those increased speeds make this new UFS card perfect for any multimedia experience: reading Full HD movies, saving high resolution photos and videos to DSLRs and 3D VR cameras, and so on. Samsung announced that the card will come at 4 different capacities: 32GB, 64GB, 128GB, and 256GB, but no price or availability date have been disclosed.